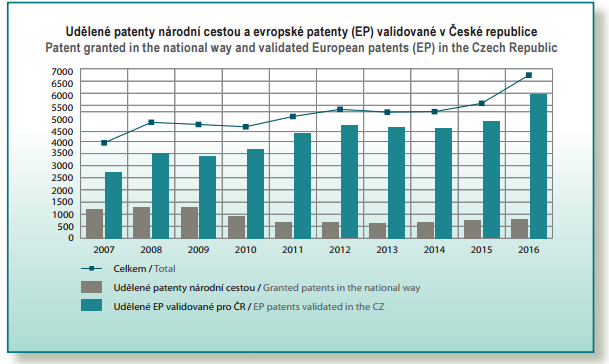 The Czech Industrial Property Office granted 781 patents in 2016, of which 637, or 82%, to domestic applicants, which is the most in the last two decades. For 78 patents granted in 2016, the duration of procedure was less than one year from the filing of an application. And 240 patents were granted to colleges and universities, which is 17 more than in 2015. In 2016, the Office managed to cut the number of pending patent applications by 18%. The total number of patents valid in the Czech Republic came to nearly 38 thousand at the end of 2016, the Office's Annual Report states. According to the report, in 2016, domestic applicants filed 792 patent applications, mainly in the fields of transport and storage, construction, health and entertainment. Almost one quarter of applications were submitted by Czech universities. Of the total number of European patents granted in 2016, 6.7% of patents were validated in the Czech Republic. With regard to Czech applicants’ interest in obtaining protection abroad, the number of applications has risen in recent years. Despite the positive development, Czech applicants are still not active enough abroad, the Office says. From 1 July 2016, Czech applicants may benefit from the use of a conducted national search when filing a PCT international application, and by selecting the Visegrad Patent Institute (VPI) as the International Searching Authority, which will perform international searches and prepare a written opinion on the patentability of the filed solution under the PCT. When using the search results, part of the search fee may be refunded to the applicant. The Industrial Property Office registered 1,187 utility models into the registry in 2016. The total number of utility models valid in the Czech Republic came to 8,398 valid documents at the end of 2016, the report shows. 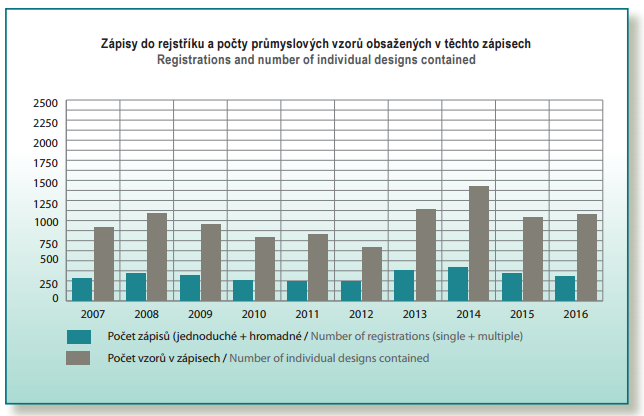 There were 342 industrial design applications filed in the Czech Republic in 2016. As expressed by the number of designs contained in the applications, 1,098 industrial designs applied for registration. Most applications came from domestic applicants. At the end of 2016, there were 3,263 registrations for industrial designs in effect. Each of these contains on average of 3.3 industrial designs. There were 600 Community designs applied for by Czech entities. There have been nearly 976 thousand designs registered and published by the EUIPO from the time of the creation of the Community designs registration system to the end of 2016. In 2016, the Office received a total of 8,225 national trademark applications, of which 7,439 were from domestic applicants and 786 from abroad. The Office recorded 6,985 national trademarks into the register, of which 6,344 were for Czech and 641 for foreign entities. In 2016, the average duration of proceedings from filing to publishing national trademark applications was 4.2 months, and the average duration of proceedings for registrations of trademark applications came to 8.7 months. In 2016, the Office received 332 applications for the international entry of trademarks abroad. For the Czech Republic, 1,414 international trademarks were designated via international registration. 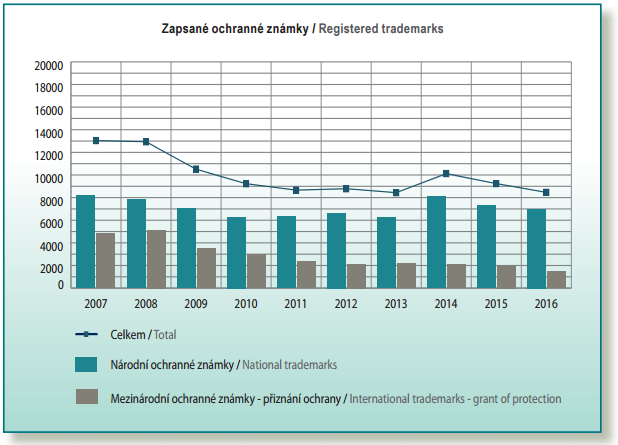 Protection was granted for 1,479 international trademarks in the Czech Republic in 2016. At the end of 2016, a total of 1,352 million trademarks were valid in the Czech Republic. research and development, the Annual Report says, adding that a patent increases the value of a technical solution as well, and in business competition acts as an indicator of technological maturity and the level of a company’s care for intellectual property. Read the 2016 Annual Report in Czech and English here.